In the coming months the Zooniverse Education Blog will feature guest posts from participants in the Zooniverse Teacher Ambassadors Workshop. Today’s guest blogger William H. Waller is author of The Milky Way — An Insider’s Guide and co-editor of The Galactic Inquirer — an e-journal and forum on the topics of galactic and extragalactic astronomy, cosmochemistry and astrobiology, and interstellar communications. Bill’s day job involves teaching courses in physics and astronomy at Rockport High School. For most of human history, the night sky demanded our attention. The shape-shifting Moon, wandering planets, pointillist stars, and occasional comet enchanted our sensibilities while inspiring diverse tales of origin. The Milky Way, in particular, exerted a powerful presence on our distant ancestors. Rippling across the firmament, this irregular band of ghostly light evoked myriad myths of life and death among the stars. In 1609, Galileo Galilei pointed his telescope heavenward and discovered that the Milky Way is “nothing but a congeries of innumerable stars grouped together in clusters.” Fast forward 400 years to the present day, and we find that the Milky Way has all but disappeared from our collective consciousness. Where did it go? For 25 years as an astronomy educator, I have informally polled hundreds of students, teachers, and the general public regarding their awareness of the night sky. Invariably, no more than 25 percent have ever seen the Milky Way with their own eyes. For city dwellers, this is completely understandable. 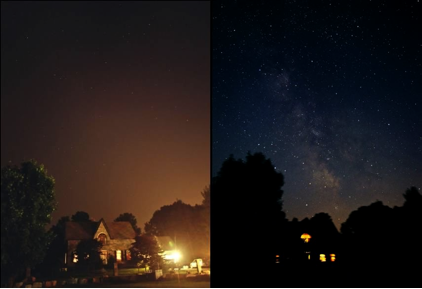 Unless properly shielded, the artificial lighting from municipal, commercial, and residential sources will spill into the sky and overwhelm the diffuse band of luminescence that is the hallmark of our home galaxy. The recent video “The City Dark” produced by POV underscores the disruptive aspects that artificial lighting can produce on the life cycles of certain animals – and even upon ourselves. For residents of small towns well away from large cities (such as my own hometown of Rockport, MA), it is much easier to find dark “sanctuaries” where the Milky Way can be spied in all its exquisite beauty. Yet when I poll Rockport’s sundry inhabitants about having ever seen the Milky Way, I still get a measly 25% positive response. What’s going on here? Is it that they don’t care about astronomy and the night sky? I would have to say that such astronomical indifference is not typical. Most people in conversations with me will volunteer their fascination for the planets, stars, and the exotica that our universe provides in abundance – from exoplanets to pulsars, black holes, dark matter, and dark energy. Images from our great space telescopes have also revealed to the casual viewer many marvels of the Milky Way Galaxy, other nearby galaxies, and the remote galaxian cosmos. Recently, stunning composite images of X-ray, visible, and infrared emission from regions of cosmic tumult have vivified the many powerful dramas that continue to unfold upon the galactic stage. 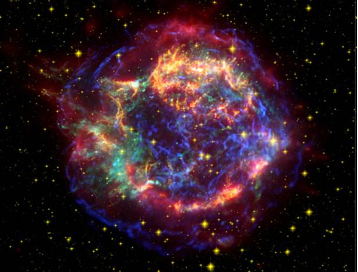 Supernova remnant Cassiopeia A, as observed 325 years after a massive star exploded. Yet, despite popular enthusiasm for the wonders of space, most people still do not bother to find a dark site and witness the source of these wonders for themselves. Otherwise, my informal polling would have indicated that they knew about the Milky Way as a naked-eye marvel. I suppose it comes down to the delivery of experiences. We have grown accustomed to having our experiences conveyed to us in familiar, safe, and readily-accessible packages – be they books, magazines, television programs, planetarium shows, or interactive websites. Regarding the latter, consider the Zooniverse online portal where anybody with an internet connection can contribute to authentic scientific research. With just your eyes and hands, you can search for exoplanets around distant suns, trace out star-blown bubbles in our galaxy’s interstellar medium, and categorize the types of galaxies that dwell in deep space. To date, close to a million people have contributed to these and sundry other online scientific investigations. Then there are the mobile apps. One popular type of app, in particular, has brought millions more people closer to the night sky. Google Sky Map, Droid Sky View, The Night Sky, and other interactive planetarium simulators enable a smartphone user to point the phone in any direction and see what stars and constellations are located there. Most of these simulators show the Milky Way as a hazy band, thus cueing the viewer to its existence. But does that mean that more people are making the effort to find dark sites for smartphone-aided star gazing? 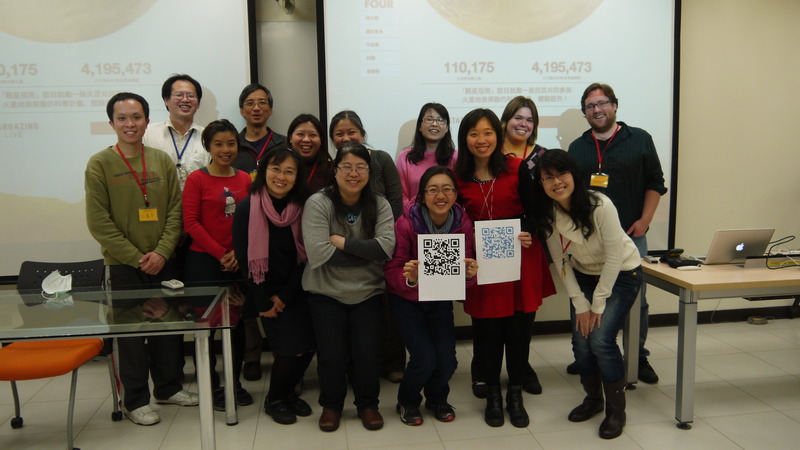 Is participation in amateur astronomy clubs on the rise as a result? And are star parties at our national parks surging with attendees? My very limited research on these questions suggests that – yes – ever more people are seeking the sublime wonders of dark skies. Whether such interactive apps are responsible for these trends remains unknown. Still, I remain optimistic. Perhaps our electronic addictions and virtual realities will ultimately re-introduce ourselves to the unembellished Milky Way – and to other direct experiences that Nature so generously provides. We may be plugged-in as never before, but still we hunger for authentic interactions with the mysterious ways of Nature. Towards these ends, I urge that we re-double our efforts to preserve the dark night sky through the advocacy of properly-shielded lighting and the establishment of dark-sky sanctuaries. To help in these regards, please visit the International Dark Sky Society’s webpage.